Over the past few weeks, major publishers have been calling on Facebook to reverse their decision to remove the capacity to edit link previews when you post content to your Facebook Page. As we've reported previously, back in April, Facebook announced a pending change to their Graph API which would remove the ability for Pages to edit link previews attached to posts - that change comes into effect this week, but the backlash has lead to Facebook providing a stay of execution, of sorts, on the feature for some Pages, with a new option that will enable publishers to maintain the capacity to edit previews. First off, to clarify what's being changed, exactly - currently, when you upload a post to Facebook, Facebook automatically generates a link preview and extracts the header image from the post to display with your link. You can edit the headline, description and image as you see fit - as you can see in this example (below), the original, auto-generated link preview is on the left, and I've edited it on the right. It's the same post, but it appears completely different. 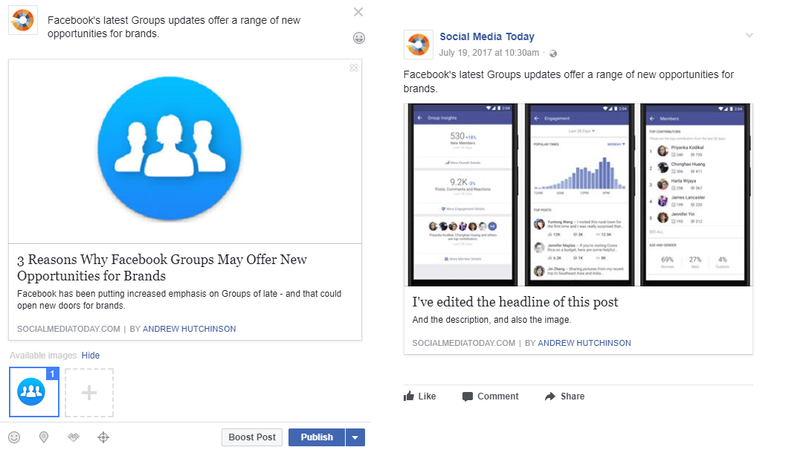 The option is great for publishers looking to A/B test their Facebook posts, or customize them to focus on specific elements or angles, but the problem is that spammers can also use the same tactics to trick people into clicking questionable links. Put in a URL for some phishing scam, re-frame it to look like something it's not, and it's the perfect bait and switch. As such, the logic of the update makes sense, but still, the functionality is hugely helpful for those trying to make the most of Facebook - which is pretty much everyone. Aside from A/B tests, you might enter a link and see that the image is not suitable to Facebook's format, you might know that the text would be more effective for your Facebook audience if written in another way - there's a wide variety of reasons why Pages edit these details, and probably utilize the option more than they even realize. In response to complaints about the change, Facebook has now announced that publishers will be able to use a new option called 'Link Ownership' which will enable them to keep editing their links as normal. "We introduced a way for publishers to indicate link ownership and continue editing how their own links appear on Facebook. Publishers can begin authorizing their Pages to modify link attachments from their website domains today. For these Pages we are extending the deprecation window to give publishers time to indicate link ownership." That extension gives publishers till September 12, 2017 to indicate link ownership, before the feature is switched off across the board. 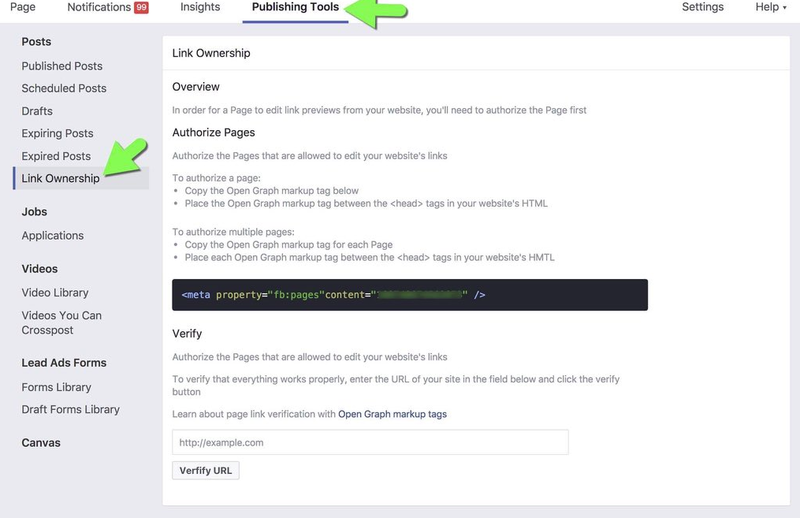 For publishers, the Link Ownership option will appear in the Publishing Tools section of your Facebook Page - but note, this only applies to media publishers. If you're a media publisher and you're not seeing this option, Facebook advises you to "reach out to your partner manager". 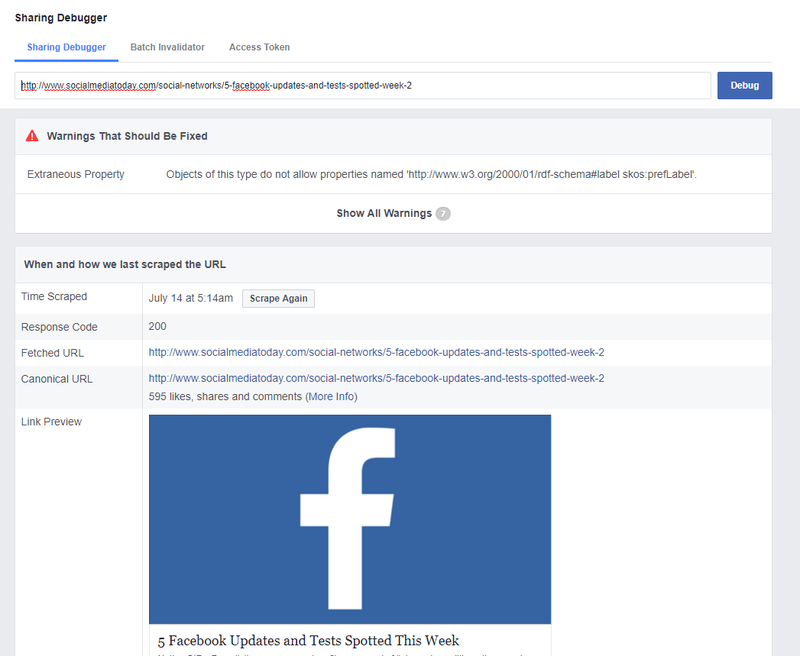 For those Pages that aren't media publishers and still want to be able to edit their link previews, your only option will be to change the Open Graph Tags on your site and posts, which can be tested through Facebook's Open Graph Debugger tool to see how they appear before you actually posts them. Enter a URL into the open Graph Debugger and it'll show you the data Facebook can pull from the link. These methods are nowhere near as easy to use, and I suspect Facebook will roll out the Link Ownership tools to more Pages in future. But they're starting with media publishers, so be prepared for a change in your process. It's the latest in Facebook's ongoing effort to restrict the spread of fake news and misinformation on the platform, along with spam, which has been a core focus of Facebook's News Feed algorithm since the beginning. Zuckerberg and Co have come under increasing pressure to act since the 2016 US Presidential Election, where the divisions within American society - and the news they were exposed to - came to the fore with the election of Donald Trump. Did Facebook play a part in this? Most definitely - research shows that 67% of Americans use Facebook, and two-thirds of them get news there, equating to around 44% of the entire population who get at least some of their news from the site. As Facebook grows, so too does its influence, and because the News Feed algorithm focuses on engagement, and giving people more of the content they engage with, it absolutely helps reinforce established opinions, further engraining them, as opposed to facilitating alternate viewpoints. Many argue that such divides have always existed - you read a certain newspaper or listen to a certain radio program and you're reinforcing your own beliefs - but social media, and Facebook specifically, amplifies this effect because you're exposed to the opinions of your relatives and friends, people whose opinions you really care about. For example, climate change may be an issue you have a passing interest in, and knowledge of, but then you see that your uncle's business is being impacted by some form of climate change movement. That's going to impact your opinion on the matter more than reading any article - previously, you'd have no idea about this or your Uncle's thoughts on the matter, but now, you being exposed to more personal insights every day, which is hugely influential. As such, it makes sense for Facebook to do what they can to crack down on misuse. Removing the ability to edit link previews could help reduce spammers in this regard, though the issues with fake and misleading news look set to persist for some time yet.